Cruise at the Beach began in 1997 with 12 to 15 cars. Now, close to 250 show up. People from across the South Bay come to show off their cars, or drool over something they wish was parked in their garage. Free every Friday from 4 – 8 p.m. Ruby’s Diner, 245 N. Harbor Dr., Redondo Beach. If you wish to display a car or require more info contact Larry Neville at (310) 962-7438. The South Coast Cactus & Succulent Society 47th annual Show and Sale. Thousands of cactus, succulents and hard-to-find plants. Expert advice for beginners and advanced. 9 a.m. – 4 p.m. South Coast Botanic Garden, 26300 Crenshaw Blvd., Palos Verdes Peninsula. Garden admission required for entrance. Adult $9, senior/student w/ID $6, age 5-12 $4, under 5 free. (310) 346-6206 or email cknightgardens@yahoo.com. Southcoastcs.org. The Rancho Palos Verdes annual Whale of a Day Celebration is a festival celebrating the migration of the Pacific Gray Whale from its summer feeding grounds in the Bering and Chukchi Seas in Alaska to the winter breeding and calving grounds in Baja California. 10 a.m. – 4 p.m. Point Vincente Interpretive Center, 31501 Palos Verdes Dr. W. Rancho Palos Verdes. For questions or information call (310) 544-5260. The 40-member orchestra’s 38th anniversary concert spotlights traditional music, song, and dance from Scotland, Ireland, and Cape Breton Island. 7:30 p.m. Tickets at brownpapertickets.com. $15. For more information visit the Fiddlers at scottishfiddlers.org, info@scottishfiddlers.org, or call (310) 266-8080. Hermosa Beach Community Theatre, 710 Pier Ave., Hermosa Beach. 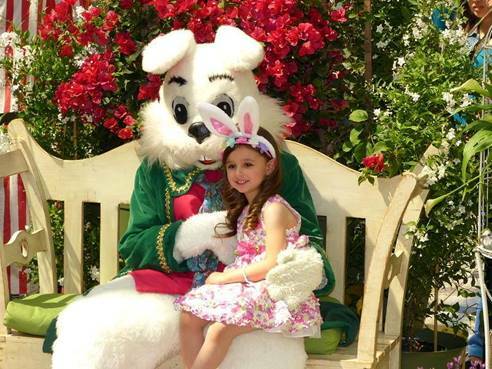 The Easter Bunny will be at the Manhattan Beach Farmers Market at Metlox Plaza. Egg hunt, train ride and some photo opportunity with the Easter Bunny. No photographer will be provided so bring your camera. 11 a.m. – 4 p.m. Contact the Farmers Market by calling (310) 379-9901 or email info@mbfarmersmarket.com. Mayor Bill Brand shares accomplishments, goals and vision for 2019. 7:30-9:30 a.m. Crowne Plaza Redondo Beach and Marina Hotel, 300 N. Harbor Dr., Redondo Beach. Chamber members $25 with reservation or non-members $35. Register online at Redondochamber.org or call (310) 376-6911. Palos Verdes Peninsula Land Conservancy presents an Earth Day Celebration and film. Activities for the whole family! 9 a.m. – 2 p.m. White Point Nature Preserve, 1600 W. Paseo Del Mar, San Pedro. Sign up at pvplc.volunteerhub.com. King Harbor Association hosts the annual Redondo Pier Earth Day Chalk Art Challenge. Create an Earth Day inspired chalk art drawing. Free. 10 a.m. – 2 p.m. Along the Splash Wall between Samba and Sport Fishing Pier, Redondo Beach Marina, 181 N. Harbor Dr., Redondo Beach. Free recycled tote bag. Non-toxic chalk for the first 100 kids. visitkingharbor.com. The Southern California Live Steamers Mini-Train rides have become a popular feature of Wilson Park. Free (Donations are tax-deductible and very much appreciated.) train rides on the third Saturday of the month from 12 – 3 p.m. Wilson Park, 2290 Washington Ave.,Torrance. For more info visit southerncalifornialivesteamers.org or facebook.com/SoCalLiveSteam. A special film screening of Free Solo, the critically acclaimed National Geographic documentary about climber Alex Honnold as he seeks to achieve his dream of scaling El Capitan in Yosemite without a rope. 5 p.m. Warner Grand Theatre, 478 W. 6th Street, San Pedro. Tickets are $10 and youth free. Please buy your tickets early to guarantee your seat. To purchase tickets visit pvplc.org. For more information call (310) 541-7613. VERTE is the annual zero waste gala benefiting Grades of Green (gradesofgreen.org), an environmental nonprofit focusing on student leadership. This VERTE is extra special as they celebrate their 10th anniversary. Ring in a #ToastToTen! Live entertainment, cuisine from the various nations making up our Eco-Leaders, a silent auction, signature cocktails, and so much more. 5:30 – 10 p.m. Cocktail hour begins at 6 p.m. Westdrift MB, 1400 Parkview Ave., Manhattan Beach. To purchase tickets visit bit.ly/verte2019, or email info@gradesofgreen.org. El Segundo Recreation & Parks Department’s annual Easter Hunt Event begins at 9:30 – 11 a.m. Holiday music with guest appearances by the Bunny and friends, who will be available for pictures with the children. Following the “meet and greet” opportunity, there will be Egg Hunts for Toddlers to 12 year olds. The age groups will be under 2 years, 2 year olds, 3-4 year olds, 5-6 year olds, 7-8 year olds, and 9-12 year olds. The first Egg Hunt will begin at 10 a.m. for the toddlers to 4 year old age groups. The second Egg Hunt for children 5 – 12 years old will begin at 10:30 a.m. For more information or directions call the City of El Segundo Recreation and Parks Department at (310) 524-2705. The Redondo Beach Community Services presents the Eggstravaganza egg hunt and family picnic. Free. Egg hunt. (bring your own basket) games, yummy treats, and fun for all ages. 10 a.m. – 1 p.m. Franklin Park, 807 Inglewood Ave., Redondo Beach. No alcoholic beverages, smoking or pets. For an egg hunt age schedule visit redondo.org/cals/city_events_calendar.asp. Celebrate redemption and be enlightened. Join the 2nd Night Seder. Something for everyone. Spiritual, Kabbalistic musical, inclusive, transformational. 6 p.m. Temple Emet, 2051 W. 236th St., Torrance. Non-Members $65. Members $62. Children under 11 $25 (Table of 8 discount 10%). RSVP to Rabbi Didi Thomas at (310) 316-3322 or Info@templeemet.ort. Parent connection group are informal walking groups provided by Beach Cities Health District and South Bay Families Connected to give parents an opportunity to connect with other parents on a range of topics. Groups are led by parent volunteers. No registration necessary. Free. Every last Wednesday of the month. 9 – 10 a.m. Aviation Park, 1935 Manhattan Beach Blvd., Redondo beach. Featuring a live panel who made their dreams come true. Among the guest speakers are Nadine Nettmann, certified sommelier and mystery novelist; Katrina Vanderlip, artist, art conservator and founder of the Vanderlip Heritage Fund, whose mission is to promote history, art, and nature on the Palos Verdes Peninsula; and Jennifer M. Shaffer, world-renowned Psychic Medium. Silent auction. Shop our distinctive Las Candalistas Creations, Garden Shop and Gourmet Pantry. 10 a.m. – 3 p.m. Catalina View Gardens, 6001 Palos Verdes Dr. South, Rancho Palos Verdes. $75. To purchase tickets visit lascandalistas.org/events/. Annual Sidewalk Sale in Downtown Manhattan Beach. Friday, Saturday, and Sunday. 10 a.m. – 6 p.m. Women’s, men’s, tween, kids, surf, beach, swim, books, gifts, jewelry, home, fragrance, shoes and more. Downtownmanhattanbeach.com. The 32nd Annual Richstone Walk for Wellness. Show support for one of the most progressive centers for the treatment and prevention of child abuse in Los Angeles, located just a few miles from downtown Manhattan Beach. Participants will walk from the Manhattan Beach Pier to the Hermosa Beach Pier and back. Check in 7:30 a.m. Pet parade 7:45 a.m. Walk 8:30 a.m. Live music, food and beverage vendors, photo-booth and more. Register, make a donation, or for information visit richstonefamily.org/.